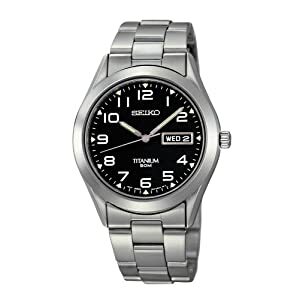 Silver tones and a black dial - a sharp contrast on a sharp looking watch. The titanium bezel and bracelet are silver toned. The dial is black with white numbers that are large and easily readable. The 3 position shows the day and date. Like other titanium watches, this one is very light and comfortable. It keeps time accurately and is water resistant to 50 meters (165 feet). Some people report that the knob catches on clothing and find this very annoying. For guys that don't wear a lot of long sleeve shirts and sweaters, this should not be an issue.